Genesis Rocket Knight Adventures (USA) in 27:18.13 by Upthorn. This game has a lot of bosses, to say the least. Because the author speeds through levels so quickly, the amount of time spent fighting bosses is actually greater than the amount of time completing the level in order to reach them. This is a 7 minute 38 second improvement over the previous movie. 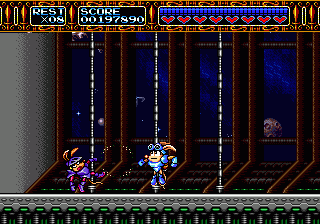 Much of this improvement is simply due to defeating bosses more quickly. The author has left detailed comments about these improvements.